The USS Salvation. 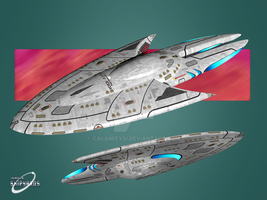 NCC - 70384. Federation Tug. I have been sitting on this design for a while and finally got around to finish it off and am happy the way it turned out. 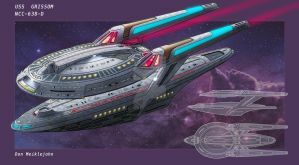 She is from the TNG era and has 4 nacelles to create a wide and stable warp field so to encompass any size of damaged ship. At the rear of the ship are the magnetic clamps that unfold to harness the damaged vessel. My idea for these clamps are based on the Earth McKinley Station which has the red arms that extend around the ship in orbit. To help position the damaged ship are 4 groups of tractor emitters. Two face forward on the forward hull 'wings' and the other two are on the vertical supports. Imulse engines are on the farthest point of the main hull so to be clear of the debris being towed. The main bridge is located on the upper pylon, whilst the main deflector is midway on the lower pylon. There are external hanger bays to assist with repairs. These hanger bays open up onto gravity plating on the ships exterior. This makes it easier for the collection of material and repairs and for Work bees to drop off material. The 4 nacelles also have exterior gravity plating at the rear so workers can work freely in space while stationary. 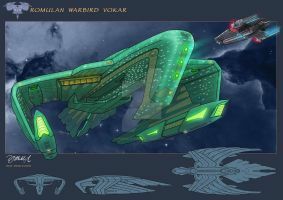 what about a cargo hauler using a similar design, I love the design concept by the way. Cool idea Poppa5050 and it would suit the ship the way the nacelle struts sit. 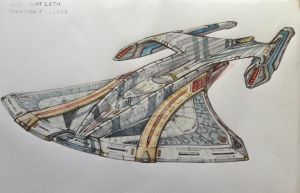 Looks solid, but star trek ships seem more vulnerable to me given that their warp engines hang outside of the ship body. But that's the same problem every time and the solution is "reverse the polarity". If i ever had the ability to build me a starship this'd prolly be it. So beautiful in its pragmatism, can even defend itself properly and thus be more flexible. I like it. Thanks for the compliment! Just wanted it to follow the Star Trek aesthetic and have a believable function in that universe. 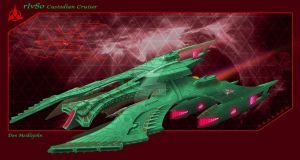 I love the fact that you created a Star Trek ship class that we've never seen yet is absolutely necessary in any Space Faring Society, A TUG! I'd never thought of it before but now that I've seen the USS Salvation it just makes sense! There are so many times where ships get damaged and abandoned in Star Trek yet it's safe to say we've never really seen a dedicated salvage ship in the series before. 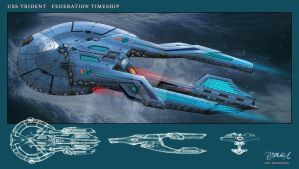 The general consensus (At least as far as I'm aware) is that every Federation ship has the capability to tow a ship of equal or lesser size (With smaller ships being able to tow larger ships at the cost of a reduced warp factor.) But why waste a captain's time with salvage duty when you can send a Commander or even a Lieutenant to do it in a designated towing ship?! More than that, having a specialize ship with tailor made Salvage and reclamation equipment would probably be extremely useful, especially when salvage targets are structurally weakened and a normal tractor beam would just rip parts of the ship off. They say you don't know what you have until you lose it... but it's also true that you don't really know what you're missing till you find it. Thanks for coming up with and then realizing such an ingenious concept Don, it's easy to be a maintainer, but it takes a lot of effort and faith to be an innovator! I've been working on a writing exercise in the form of a Private Fan Fiction which takes place in the Star Wars Galaxy and brings technology and People from Star Trek and Stargate (along with a few other franchises) in as well in one big Sci-fi Crossover. It's still in development and won't be made public anytime soon (Or ever, unless something changes) but I was wondering if you'd be interested in seeing a bit of it some time since I'd like to incorporate the USS Salvation (or at least its concept) into the story. Don't worry if you don't want to, Fan Fiction is an ocean filled with uncertainty and danger, along with a few pretty reefs and sunken treasure ships if you know where to look. On that note, I'd like to hear your thoughts on whether you think the Salvation could tow a Lucrehulk Droid command ship or not... and if not, then what you think it would take to make that possible. 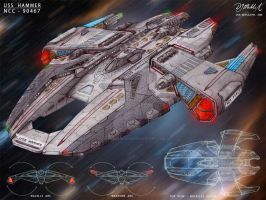 (What if larger ships could be towed if the Salvation attached special Warp Field Boosters (Like miniature Self contained warpcore/warp nacelle modules to the surface of a larger than average ship or space station? We have pattern enhancers for Transporters, why not Warp Field Boosters for Salvage and transport? Thanks for the amazing feedback I really appreciate it! 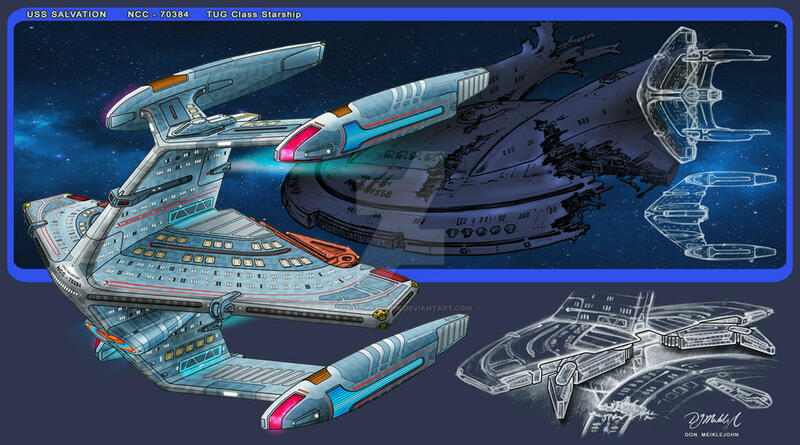 I cannot take credit for coming up with the Tug Starship idea though as it has been mentioned in Star Trek episodes before and I have seen some bulky looking designs for Tugs from the TOS era for towing cargo. I just wanted to make it into more of a functioning design and bring it into the TNG future. Glad you like the design and thanks again! The Tug idea would be a nice addition to your fan fiction. I hope you come up with an amazing story. Ah! That makes sense, thanks for info, it takes all kinds to make a world doesn't it? Thanks I'll see what I can come up with, concerning another Tug concept. 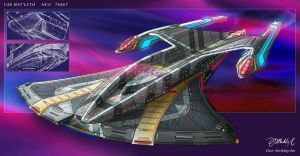 Since the story will involve a lot of franchises and races from each coming together under a single banner, I can't wait to blend Quantum Slipstream Drive with Stargate Hyperdrives, Romulan Singularity cores with Star Wars technology and so on. You've already helped me a lot since seeing your Picture got me thinking about the possibility for Warp field boosters and stuff like that so thanks again bud! thats not a compliment... or is it? I like it when people bring their ideas a functional Concept and not just a Picture. This Ship is Odly shaped on the first look, but on the second look everything has its meaning and logic. once again Really nice. i think i copy this basic idea in my own sci fi Univers. Wow this is an absolutely crazy shape! Love it! Interesting. Not sure about the design but intriguing. That is a great looking ship! I really can find you below near most ST ships Kai. This is a ship I could get behind! Now that is an interesting concept!